One of the naturally occuring design conundrums with GSB is preventing there emerging any single killer strategy that always wins. I’ve put a lot of time and effort into avoiding this, both before and after releasing the game. One way to do this is the conventional Rock Paper Scissors design, where there is a counter for each weapon. But GSB introduces a new quirk, in that you can tell 100% absolutely what the enemy brings to the battle, and how they behave. One of the best ways the game prevents killer game-killing strategies emerging is variety between battles. Because the size of maps, the spatial anomalies and the race of the enemy is different in each map, the player is (hopefully) working with different strategies on each map, having to adjust their fleet design to fit the cirumstances. In addition, financial and pilot limits also restrict the design of fleet. And Generally… I think for the majority of the non obsessed uber-gamer, this is working ok. The problem is that although a strategy doesnt emerge that wins every battle with the same effectiveness, it is true that sometimes the best fleet turns out to be aesthetically very dull. Such as a block of 64 identical frigates all flying in formation. This isn’t what GSB is about, so I need a way to make the player design fleets that not only win, but look l33t. Enter supply limits, which I’m working on now (in-between testing the now almost done expansion pack). The general idea is that as well as having pilot and cash limits, a scenario (or a challenge) can support arbitrary total limits for any ship component. So for example, there may only be 11 frigate engines available, and 3 plasma launchers, meaning that certain ship designs are now only deployable in small numbers. By default, every module has infinite supply, but the scenario can limit some, none or all of them. In code terms this is nearly done, but in UI terms it will take ages :D. However, I am very very excited about seeing the effect it will have on the game, especially going onwards into its potential for user-designed scenarios. It wouldnt be a massive leap further to allow challenges with player-chosen supply limits, and take that extra step towards letting GSB players shape the nature of the competitive game. Supply Limits: It’s the future! As it is the UK custom to drop the interest rate on all bank accounts, and then open new ones each month with a higher rate (to screw customers out of money) anyone who keeps an eye on things in the UK and doesn’t like rip-offs has to constantly change bank accounts. send us one document from each of the two lists below to our freepost address by 26-Dec-09. Please send only certified copies of your documents, and not the originals. Certified simply means documents that have been signed and dated by a lawyer, notary public or banker using an official stamp, and with their name and address written on it. We look forward to welcoming you as a Citibank customer. Note: Please do not reply to this email, because this email address is not set up to receive incoming email. When preparing the way for the games expansion pack, I’ve put a lot of time into making it as flexible as possible, in the hope that players will be able to add content and mini expansions of their own. Everyone has their own ideas on what spaceships look best etc, and I’d love to make modding GSB really easy. To that end, the expansion has been a great ‘test case’ in that it forces me to make add-on content easy and modular. Basically the game lists a checkbox for each installed mod or expansion pack, and defaults to them all being on. Any challenge you submit is tagged with them all, unless you untag them on submission. 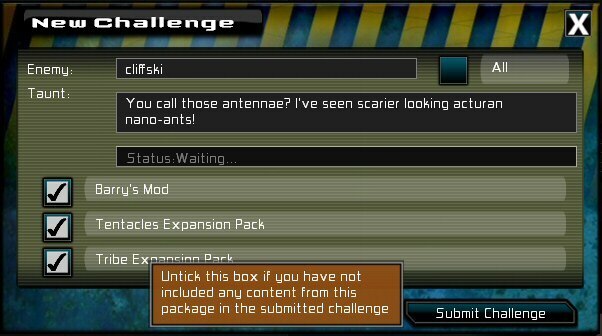 This way, unfortunately you can tag them wrong, and upload a challenge which will crash if the player doesn’t have the data, but you would have to deliberately do that. What it does allow you to do is to still issue ‘basic game’ challenges, as well as ones with new content. More importantly (and the reason its not an automated file compare thing), is the ability for anyone to create a mod, give it a user-friendly name, and upload challenges with it in, which will flag up a notice explaining what’s missing for people who attempt it. I’ve probably explained it really badly. In any case, that screenshot is of my test case with 3 packages installed locally. Thoughts? I’ve been play testing a bunch of battles today. It’s scary how many times you need to play a scenario to even be sure it poses a proper challenge. I think I’m maybe half way there, in terms of the two extra maps. When I make the scenarios, I try to put together a fleet that will put up a bit of a battle against all the existing races. Everyone has their favorites, and ideally nobody will be able to just cakewalk through the two new missions on all 3 difficulties without tweaking their fleets. The new race has short range but rapid firing weapons, and has to basically charge right up to the enemy and bombard them at close range. This can be a surprisingly good tactic for big cruisers, especially against fleets which rely on missiles and plasma. You might think that getting in close helps the enemy, because it means the missiles hit quicker and can be relaunched, but if you can get close enough, you can be inside the enemy cruisers minimum range. There will be an expansion pack for GSB, and it’s still a little way off, but I did some work on it today so it’s fresh in my mind. Before I release it, there will be another mainstream GSB patch, mainly to improve the modding support to tidy things up and make mods more manageable. After the pack, who knows what’s next? Anyway… current plans for the pack are to introduce a new race to the game. It will have the same variety of ships as the other races. The ships will also have a few race-specific modules, and some quite drastic ship bonuses. It was a relief to work out that ship bonuses can be negative, meaning this new batch of ships will have weak shields, weak armor, and very strong hulls. My plan is that these ships can take a sustained battering and rely on hull strength and repair systems. The new weapons will be kinetic bullet-firing stuff, like gauss guns / autocannons. I’ve been sorting out the sounds and visuals for them today. There will also be two new scenarios featuring the new race, and it will likely come pre-unlocked so if you buy it you can play with that race immediately. Whenever a developer releases an expansion pack, there are always debates from a small subset of players that expect the content for free, or oppose the idea of expansion packs. Personally, I’m a huge supporter of them. I wish Company of Heroes had many more! The way I see it, expansion packs are about giving people options. Some people will snap up extra GSB content immediately. Many players will not. The main thing is you have the choice. Why release a game at a high price that puts some people off when you can release the core game at a lower price and let people choose if they want to have extra content? I haven’t picked a price for the pack yet, I keep changing my mind on that. I’m only looking to recoup the cost of making it, so it’s just a matter of how many people I think will buy it, balanced against the art and sound costs and the time working on it.